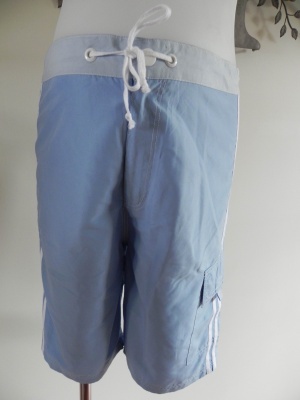 These brand new board shorts by Patch are perfect to wear swimming or for leisurewear. These normally retail for $40.00. The fabric is a lovely soft brushed polyester. They are 2 pale blue with a white stripe down each leg at the sideseam. 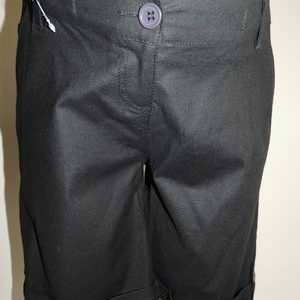 The shorts have a zipper fly and stud fastener and they do up through the waist with an adjustable drawstring. They measure approx 59cm long. There is also a pocket with flap and velcro fastener on the left leg at the side. These are perfect worn over your bathers or with a bikini or tankini top. Be the first to review “NEW Blue Side Stripe Maternity Board Shorts” Click here to cancel reply.